You've heard us talk about how MerchantCircle delivers results for merchants like you. I thought it was about time we let a merchant tell you how it's worked for them. 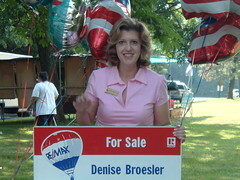 Denise Broesler is a RE/MAX Prestige realtor in Cranford, NJ. She's been with MerchantCircle for a couple of months, and has created a great blog, in addition to purchasing a free Google campaign with her AdDollars. She's also been a big help with an experiment we're doing with local television in her area. If you are in her neighborhood, keep an eye on the television (especially HGTV) over the next couple weeks so you see her television ad we helped create for her. "When I started working with MerchantCircle, I was impressed by the professional and courteous attention of their staff. I was easily able to locate businesses in my area, and forward them information on joining the group. Because of my response, I was awarded free advertising dollars with Google's Sponsored Links. Imagine my delight when searching in Google and finding my free ad from MerchantCircle! I was even spotted in my parking lot by another MerchantCircle customer who joined the site! I loved getting my free commercial and can't wait for it to air next week. Every business who wants to get exposure on the web should hook up with MerchantCircle. It's like an internet Chamber of Commerce." Thanks, Denise. We'll keep you posted on the results of our tests. Meanwhile, if you haven't done it yet, try creating a free Google AdWords campaign, and see for yourself how many new customers you get. Get your point of view out there, Walmart is. Want a television ad for your business?